It is with deep sadness that we announce the passing of Anne Backer of Chemainus, BC, at the age of 84 years. She is survived by her three sons Ralph (Judi), Gerald (Beth) and Harold, and 7 grandchildren, Melanie and Jenelle, Lara and Katherine, and Adelaide, Emma and Harrison. She was predeceased by her loving husband, Eckhard (Bill) Backer, in 2015, by her parents, Per and Margit Kolstad (nee Schjelle), and by her brother, Sigurd Inge Kolstad and her sister, Brit Heidrun Jorgensen. Anne was born in the village of Lesja, in the region of Gudbrandsdal, in Norway. In her school years, she learned both English and German. She graduated from high school at Voss Landsgymnas, in the municipality of Voss. She immigrated to Canada as a young woman in 1955, first living in Vancouver, and then moving to Whitehorse, where she had landed a job as a bank teller working for CIBC. It was in the Yukon that she met Bill, her husband of 59 years. Anne became a homemaker after that, and she and Bill moved their family to a number of different places to follow his work, including Flin Flon and Selkirk, Manitoba, Ladysmith and Saltair, and then in 1968, to Ilo, a city in the country of Peru, where they lived for 13 years. It was in Peru that she learned a fourth language, Spanish. Their love for the local area drew them back here once again, to settle in Saltair for many years, and then finally in Chemainus. She leaves behind many good friends here, whom she appreciated very much. Anne was also able to reap the rewards of being an Avon representative, first in Ladysmith and Saltair between 1966 - 68, and then again from 1982 - 88. She particularly enjoyed those times, as it gave her the opportunity to meet and get to know many locals. Anne was a loving wife, mother and Oma, and she cared deeply for her family. She loved doing crafts, including knitting, tatting, embroidery and crocheting, and she was very artistic, making many high quality items over the years. She was also an awesome cook, and we will always remember the variety of delicious German Christmas cookies that she would make, her Norwegian pancakes, and her rice porridge at Christmastime. She very much enjoyed hiking, travelling, and getting out and exploring new places, and particularly so on Vancouver Island. She was deeply influenced by the Norwegian culture, and was very proud of her Norwegian upbringing and heritage. Her family and friends in Norway always held an important place in her heart. At Anne’s request, there will be no funeral service. In lieu of flowers, donations may be made to the Heart and Stroke Foundation of Canada. 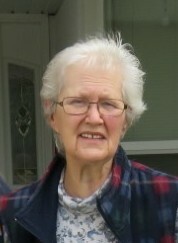 A gathering may be held at a later date to honor her memory.